Kim works with the following programs at Mote; Shark and Ray Conservation Program, Education, and the Sarasota Dolphin Research Program. As part of her work with the Sarasota Dolphin Research Program Kim is employed by the Chicago Zoological Society (based at Mote Marine Laboratory as part of a partnership to engage in dolphin research, education, and conservation action). Kim is also employed part time with Mote and since 2006 has worked with Mote's Education Division as a research mentor for the High School Intern Program. 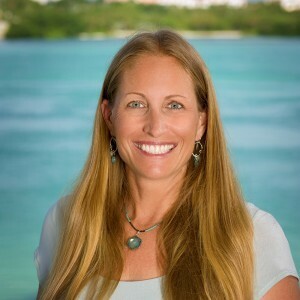 Since 2009 Kim has led a research project documenting spotted eagle ray biology, behavior, and fisheries impacts in Florida, Mexico, and Cuba with the Shark and Ray Conservation Program. Adimey, N.M., C.A. Hudak, J.R. Powell, K. Bassos-Hull, A. Foley, N.A. Farmer, L. White and K. Minch. 2014. Fishery gear interactions from stranded bottlenose dolphins, Florida manatees and sea turtles in Florida, USA. Marine Pollution Bulletin 81(1):103-115. Bassos-Hull, K. 2014. Marine Wildlife Entanglements in Florida Waters: Impacts and Trends. NOAA Florida Marine Debris meeting, St Petersburg, FL. 20-22 May 2014. Bassos-Hull, K., K.A. Wilkinson, P.T. Hull, D.A. Dougherty, K.L. Omori, L.E. Ailloud, J. Morris, and R.E. Hueter. 2014. Life history and seasonal occurrence of the spotted eagle ray, Aetobatus narinari, in the eastern Gulf of Mexico. Environmental Biology of Fishes 97(9):1039-1056. Bassos-Hull, K., R. Perrtree, C. Shepard, S. Schilling, A. Barleycorn, J. Allen, B. Balmer, W. Pine, and R. Wells. 2013. Long-term site fidelity and seasonal abundance estimates of common bottlenose dolphins (Tursiops truncatus) along the southwest coast of Florida and responses to natural perturbations. Journal of Cetacean Research and Management. 13(1):19–30. Wells, R.S., K. Bassos-Hull and K.S. Norris. 1998. Experimental return to the wild of two bottlenose dolphins. Marine Mammal Science 14:51-71.